The name "earwig" is undoubtedly one of the least explicable colloquial names for an insect, rivaling "snake doctor" in the magnitude of its inaccuracy. (This term is a descriptor for dragonflies in the Deep South, referring to the folk tradition that they somehow stitch up wounded snakes; Hand, 1976). The name apparently originates from an old myth that these unobtrusive creatures nest in the ears of sleeping humans, a behavior that inevitably goes along in the popular imagination with habitual brain-eating. This belief is of course false; earwigs are no more likely to invade one's ears than any other insect with a desire to hide in dark, humid crannies. Which is admittedly meager comfort to any entomophobes who may be out there. But what is an earwig in a taxonomic sense? A member of the Dermaptera (no, not Dermoptera*): a cosmopolitan order of medium size (1,784 extant spp. in 11 families; Sakai, 1982). They are dorsoventrally flattened, with an elongate abdomen capable of some muscular telescoping. Morphologically, earwigs' most distinctive traits are a lack of ocelli†, unsegmented pinching cerci (almost antler-like in the Opisthocosmiinae), forewings sclerotized into tegmina, and semicircular hindwings which unfold fan-style (see right) (in the case of those with wings; Haas et al., 2000). But most of these these traits apply only to the members of the traditional suborder Forficulina, which constitute the majority of the global earwig fauna: those earwigs belonging to the suborders Arixeniina and Hemimerina are wingless and bear segmented cerci. Both are restricted to lone families: the latter (Hemimeridae) solely inhabit the fur of pouched rats (Nesomyidae: Cricetomyinae) in sub-Saharan Africa (Rehn & Rehn, 1935), grazing on the many varieties of their hosts' cutaneous grunge; their broad bodies, shortened retractable legs and smallish size (5-15 mm. long) make them unmistakable (Nakata & Maa, 1974). Indeed, so unlike most earwigs were they that Hemimerus was initially described as a cricket (Walker, 1871) and later allied with the ectoparasitic beetle Platypsyllus castoris (Sharp, 1892). It can be said that the initial entomological reaction to the Hemimeridae could be summed up in three letters: W, T and F (in that order). The former family (Arixeniidae) have a similar diet, but live on Malayan and Filipino bats of the genus Cheiromeles (Molossidae); these earwigs are more free-living than their rat-dwelling counterparts, being also found in their hosts' roosting areas (Medway, 1958). Arixeniids are significantly larger than hemimerids (25 mm. ), with far shorter cerci, and conform to the weirdly long-legged habitus of many commensal insect inhabitants of bat fur (Nakata & Maa, 1974). Both of these families have adapted to an epizoic lifestyle by developing live birth (vivipary)—with embryos each developing at the termini of ovarian follicles, nourished by a thickened epithelium dubbed a "pseudoplacenta" (Hagan, 1951). Gestation in Arixenia esau is additionally complicated by the movement of older fetuses into their mother's oviduct, which is modified into an ad hoc uterus (Tworzydlo et al., 2013). 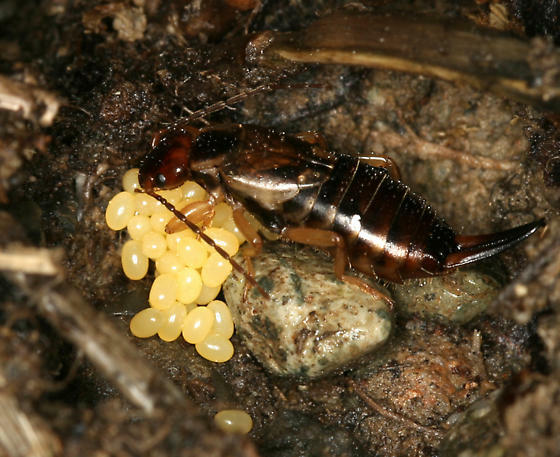 It probably goes without saying that other earwigs conventionally lay eggs, except for the unexplained aberration that is Chaetospania borneensis (Spongiphoridae) (Kočárek, 2009). Due to these considerable subordinal differences, the Dermaptera has on occasion been restricted to the Forficulina (Steinmann, 1986) or to that suborder and either the Hemimerina (Giles, 1963; Popham, 1985) or Arixeniina (Popham, 1961; Giles, 1974); indeed, the only robust trait uniting all earwigs as distinct from other "orthopteroids" is invisible to the naked eye: holocentric chromosomes (Rentz & Kevan, 1991). It has become increasingly clear that the epizoic families of earwigs must derive from within the Forficulina (Haas & Klass, 2003; Jarvis et al., 2005; Kočárek et al., 2013), although their precise phylogenies are still debated (Engel & Haas, 2007; Kočárek et al., 2013). Regardless, the trinity of Hemimerina, Arixeniina, and Forficulina are justifiably sunk into a single suborder termed Neodermaptera (Engel, 2003): a particularly sensible classification when one considers them in opposition to the extinct lineages of earwig. Hence, for further illumination of earwig evolution we must draw on data derived from the field of paleontology, despite the fact that the dermapteran fossil record is far from copious (Wappler et al., 2005). Nevertheless, it includes not only representatives of the extant superfamilies Pygidicranoidea—putatively dating as far back as the late Jurassic (Shcherbakov, 2002) or no later than the mid-Cretaceous (Engel & Grimaldi, 2004)—and Forficuloidea (Wappler et al., 2005), as well as members of the similarly living families Labiduridae (Zhao et al., 2010) and Diplatyidae (Engel, 2011); but also two wholly prehistoric suborders: the Archidermaptera (Jurassic of Eurasia; Whalley, 1985) and Eodermaptera (later Jurassic of Kazakhstan and Manchuria, perhaps extending to as late as the Cretaceous; Zhang, 1994; Zhao et al., 2010). The latter suborder is evidently akin to the Neodermaptera, as deduced from their shared lack of annulation in the cerci (Haas & Kukalová-Peck, 2001) and 3-3-3 tarsal formula‡, but differ in their retention of ocelli (Zhao et al., 2010). In their turn, the Archidermaptera (which include five families; Grimaldi & Engel, 2005) are distinguished from the remainder of the order by the presence of venation in their tegmina and primitively segmented cerci: although it should be noted here that nymphs of Karschiellidae and Diplatyidae (Neodermaptera) do also retain like segmentation (Burr, 1911; Shimizu & Machida, 2011b), hinting at already apparent paraphyly among these ancient earwigs (Willmann, 1990). Interestingly, external ovipositors have been located in fossilized archidermapteran females, showing that they embedded their eggs within substrates: the implication being that archidermapterans did not excavate burrows to shelter their brood, therefore among them possibly precluding the maternal care and subsocial behaviors (Vishnyakova, 1980) known among all "forficulinan" families with the exception of the Apachyidae (Shimizu & Machida, 2011a). But enough of the evolutionary biography of earwigs as a taxon; what of their lineage? No self-respecting overview of the scientific opinion on this subject could omit mention of the diverse order Protelytroptera, which are temporally restricted to the Permian Period and crop up throughout what was then the supercontinent of Pangaea (Kukalová, 1966). Formerly, the classification of the Umenocoleidae herein (Carpenter, 1992) extended protelytropterans' range beyond the massive Permo-Triassic extinction (Arnett, 2000): but umenocoleids have since been unmasked as bizarre cockroaches (Vršanský et al., 2002). The most salient protelytropteran trait would be their sclerotized forewings, which paleoentomologists even go so far as to term "elytra" in likeness of the analogous (but not homologous) features for which beetles are known: indeed, several protelytropterans were once upon a time mistaken for some form of quasi-beetle (Tillyard, 1924; Laurentiaux, 1953). Wing structures in the order are suggestive of an affinity with earwigs, and it is as such held that the Dermaptera descend from within the Protelytroptera (Haas & Kukalová-Peck, 2001): but this theory remains unconfirmed. Other than their inclusion in the clade Polyneoptera, we can say little and know less of the broader relations of this ordinal duo: proposals vaguely lean towards distant kinship with the Notoptera, Dictyoptera (mantids/cockroaches/termites), Zoraptera, Plecoptera (stoneflies), or selections from the above in one permutation or another (Boudreaux, 1979; Haas & Kukalová-Peck, 2001; Jarvis et al., 2005; Terry & Whiting, 2005; Wheeler et al., 2001; Simon et al., 2010). In the end, the jury is still out as to the exact origin of earwigs. I could have told you so right out of the gate; but where's the fun in that? *As this would refer to colugos, which belong in a wholly different superphylum. †The trio of ommatidia situated between the compound eyes in the insect cephalic groundplan. ‡Which is to say that all of their tarsi consist of five segments. Burr, M. (1911). Dermaptera. Genera Insectorum, 122, 1-112. Engel, M. S. and Grimaldi, D. (2004). A primitive earwig in Cretaceous amber from Myanmar (Dermaptera: Pygidicranidae). Journal of Paleontology, 78(5), 1018-1023. Giles, E. T. (1963). The comparative external morphology and affinities of the Dermaptera. Transactions of the Royal Entomological Society of London, 115, 95-164. Haas, F.; Gorb, S. N.; and Wootton, R. J. (2000). Elastic joints in dermapteran hind wings. Materials and wing folding. Arthropod Structure and Development, 29, 137-146. Haas, F. and Kukalová-Peck, J. (2001). Dermaptera hindwing structure and folding: new evidence for familial and superordinal relationships within Neoptera (Insecta). European Journal of Entomology, 98, 445-509. Haas, F. and Klass, K. D. (2003). The basal phylogenetic relationships in the Dermaptera. In Klass, K. D. (ed. ): Proceedings of the 1st Dresden meeting on insect phylogeny: "Phylogenetic Relationships within the Insect Orders" (Dresden, September 19-21, 2003). Entomologische Abhandlungen, 61, 132-133. Hagan, H. R. (1951). Embryology of Viviparous Insects. New York City: Ronald Press. Kočárek, P. (2009). A case of viviparity in a tropical non-parasitizing earwig (Dermaptera: Spongiphoridae). Tropical Zoology, 22, 237-241. Laurentiaux, D. (1953). Insects. In Piveteau, J. (ed. ): Traité de Paléontologie, 3, 397-527. Medway, L. (1958). On the habit of Arixenia esau Jordan (Dermaptera). Proceedings of the Royal Entomological Society of London (A), 33, 191-195. Nakata, S. and Maa, T. C. (1974). A review of the parasitic earwigs (Dermaptera, Arixeniina; Hemimerina). Pacific Insects, 16, 307-374. Popham, E. J. (1961). On the systematic position of Hemimerus Walker—a case for ordinal status. Proceedings of the Royal Entomological Society of London, Series B; 30, 19-25. Popham, E. J. (1985). The mutual affinities of the major earwig taxa (Insecta: Dermaptera). Zeitschrift fur Zoologische Systematik und Evolutionforschung, 23, 199-214. Rentz, D. C. F. and Kevan, D. K. M. (1991). Dermaptera. In Naumann, D. T. (ed.) (pp. 360-368): Insects of Australia. Melbourne: CSIRO. Sakai, S. (1982). A new proposed classification of the Dermaptera with special reference to the checklist of the Dermaptera of the world. Bulletin of Daito Bunka University, 20, 1-108. Sharp, D. (1892). Concerning Hemimerus talpoides Walker. Entomological Monthly Magazine, 28, 212-213. Shcherbakov, D. E. (2002). Order Forficulida Latreille, 1810. The earwigs and protelytropterans (=Dermaptera DeGeer, 1773+Protelytroptera Tillyard, 1931). In Rasnitsyn, A. P. and Quicke, D. L. J. (eds.) (pp. 288-291): History of Insects. Dordrecht: Kluwer Academic Publishers. Simon, S.; Schierwater, B.; and Hadrys, H. (2010). On the value of elongation factor-1α for reconstructing pterygote insect phylogeny. Molecular Phylogenetics and Evolution, 54, 651-656. Steinmann, H. (1986). Dermaptera: Catadermaptera I. Wermuth, H. and Mühn, E. (eds. ): Das Tierreich 102. Berlin: de Gruyter. Tillyard, R. J. (1924). Upper Permian Coleoptera and a new order from the Belmont Beds, New South Wales. Proceedings of the Linnean Society of New South Wales, 42(4), 720-756. Vishnyakova, V. N. (1980). Earwigs from the Upper Jurassic of the Karatau range. Paleontological Journal, 1, 78-95. Vršanský, P.; Vishnyakova, V. N.; and Rasnitsyn, A. P. (2002). Order Blattida Latreille, 1810. In Rasnitsyn, A. P. and Quicke, D. L. J. (eds.) (pp. 263-270): History of Insects. Dordrecht: Kluwer Academic Publishers. Walker, F. (1871). Catalogue of the Specimens of Dermaptera Saltatoria in the Collection of the British Museum (pt. 5). London. Wappler, T.; Engel, M. S.; and Haas, F. (2005). The earwigs (Dermaptera: Forficulidae) from the middle Eocene Eckfeld maar, Germany. Polskie Pismo Entomologiczne, 74(3), 227-250. Whalley, P. E. S. (1985). The systematics and palaeogeography of the Lower Jurassic insects of Dorset, England. Bulletin of the British Museum of Natural History (Geology Series), 39, 107-189. Willmann, R. (1990). Die Bedeutung paläontologischer Daten für die zoologische Systematik. Verhandlungen der Deutschen Zoologischen Gesellschaft, 83, 277-289. Zhang, J. F. (1994). Discovery of primitive fossil earwigs (Insecta) from Late Jurassic of Laiyang, Shandong and its significance. Acta Palaeontologica Sinica, 33, 229-245.